With his first recording since signing with Motown Gospel, Wilson mixes mostly live recording with some studio tracks for a contemporary gospel release that will inspire and energize listeners. New Essential Records group I Am They releases its self-titled debut project this month. Comprised of Adam Palmer (lead vocals and guitar), Matthew Hein (lead vocals and guitar), Stephanie Kulla (lead vocals), Justin Shinn (keys), Bobby Stiehler (bass) and Sara Palmer (drums), the modern-worship group hails from Carson City, Nevada. Recorded live at a mountaintop retreat near Redding, California, this release from Bethel Music presents 11 new songs from the group’s artist collective, including several debut singers. Songs include “Ever Be,” “Who Can Compare to You,” “In Over My Head (Crash Over Me),” “You Are My One Thing,” “Jesus We Love You,” “Seas of Crimson,” “You Don’t Miss a Thing,” “Home,” “No Longer Slaves,” “Nearness” and the title track, the result of a spontaneous moment of worship. Along with the music, a film chronicling the creation of the worship event from which the album came is also available. Paying tribute to one of gospel’s classic groups, The Happy Goodmans, a newly formed trio offers Songs in the Key of Happy. Goodman Revival—with members Tanya Goodman Sykes, Michael Sykes and Happy Goodmans singer Johnny Minick—continue the Goodman gospel legacy. Songs include Southern gospel favorites and Goodman classics such as “What a Happy Time,” “This Is Just What Heaven Means to Me” and “I Don’t Want to Get Adjusted.” The disc also features guest appearances by the Gaither Vocal Band and Russ Taff. Still riding the energy of the breakout film God’s Not Dead, Christian pop group Newsboys continues to strive for fresh new ways of delivering timeless truth. For their latest album, band members found inspiration in the church hymnal. Hallelujah for the Cross (612058638014, First Company Management/Capitol Christian Distribution), the group’s Nov. 4 release, delivers the message of traditional hymnody to the group’s younger listeners. Songs such as “Holy, Holy, Holy,” “I Surrender All,” “It Is Well” and “All Hail the Power of Jesus’ Name” are given the Newsboys’ treatment. On “All Hail the Power,” Tait goes a capella, complete with high and low parts and vocal instrumentation. The new record is the fourth to feature Tait as the group’s lead singer, and he feels really good about the place the band is in now. 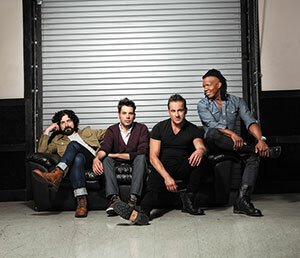 With a string of hit albums, recent concerts that have seen triple the crowd numbers as normal and a blockbuster movie appearance (God’s Not Dead 2 is being discussed, Tait said), “Newsboys 2.0,” as they’ve dubbed this version of the band, has become the standard, and Tait’s voice guides most of the band’s more recognizable songs. Tait said recently he read a tweet of a young teenage boy who posted a picture of the band’s previous incarnation featuring Peter Furler as frontman. Learn more about Hallelujah for the Cross at capitolchristiandistribution.com. Adamec delivers his unique brand of adult contemporary music with debut release My Only Answer. The Florida native honed his craft as a worship leader for YouthQuake and Campus Crusade for Christ (CrU). Reflecting the style of artists Brandon Heath, Hillsong, OneRepublic and One Sonic Society, Adamec’s music should appeal to fans of worship and modern pop styles. Modern rock’s Thousand Foot Krutch returns with the group’s first new studio release in two years, Oxygen: Inhale. Produced by the band’s frontman, Trevor McNevan, and Aaron Sprinkle (One Republic, Anberlin, Pedro the Lion), the album features the high-energy “Let the Sparks Fly” and melodic “War of Change,” among others. Family Force 5—comprised of Derek Mount (nicknamed “Chap Stique”), Jacob Olds (“Crouton”), Joshua Olds (“Fatty”), Nathan Currin (“Nadaddy”) and Teddy Boldt (“Hollywood”)—releases the 15-song Time Stands Still. “BZRK,” the first video from the album, garnered more than 250,000 views and 2,400 likes on YouTube in just eight days. Songs include “Let It Be Love” and “Walk on Water,” featuring Melodie Wagner of Hillsong Young & Free. The disc was produced by Riley Friesen (Vota, Staggerford) and Seth Mosley (Newsboys, For King & Country).